I'm back with another Halloween tutorial. This time around, I wanted to step my game up a bit and pull out some fun FX and Theatrical Makeup for this look. I was inspired by a small jar of silver powder to do this look. Honestly, I didn't really have a plan when I did this look. All I knew is that I wanted lots of silver, tiny little metal like appliques, and expression lines. 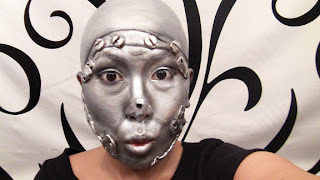 You can use your imagination to come up with the look and it helps to get inspiration from pictures of different Tin Men from the internet. I started out with a bald cap which I painted with the silver metal powder. This gave me a more tin man/robot feel. 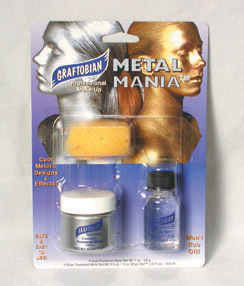 Graftobian's Modeling Clay really helped me created all of the cool nuts and bolts and metal plates which were attached to my face. Finish off with some black powder and expression lines and you've got your tin man/woman! This year, let's hope that the Tin Man gets some love when you dress up with your friends for a Wizard of Oz theme. Ciao bellas! FTC Disclosure: Products sponsored for video. I am not affiliated with the company and not paid to make this video. These are my honest thoughts and opinions. Wow! Amazing! You are great at what you do!